« Is BT running a dirty tricks campaign against its broadband competitors? 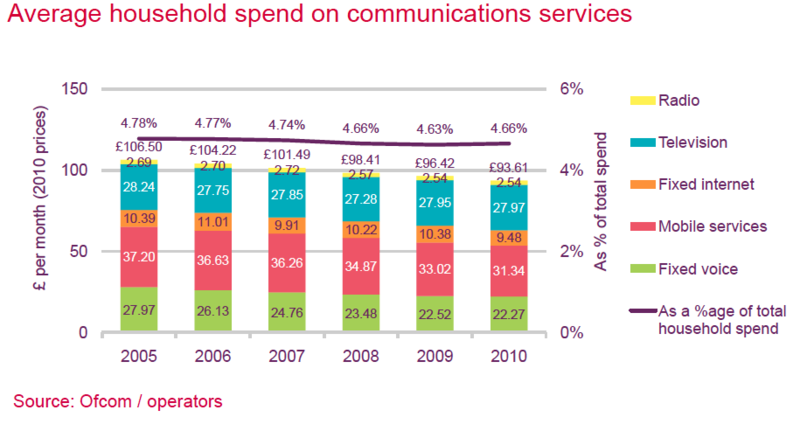 … if that is an ‘average’ and if ofcom’s figures are correct, then some families could save far more than that. I think the TV figure is fixed because of the licence fee, but all the rest could come through a fibre far cheaper than it is coming through the copper and airwaves? I think you are missing the bit about the mobile “addiction”. That’s the reason to get fat fibre pipes into the moors, dales and fells – to feed that addiction with FiWi. 3G base stations interconnect nicely with fixed wireless links (microwave dishes). The biggest cost item is the mobile comms, having your beloved fibre would not in my opinion make a whole lot of difference to this. If someone wants a mobile number in order to be contactable and then wants to be able to make calls they’ll be using the cellular network and the mobile spend will be similar, surely ? If we can’t manage ubiquitous 2G mobile then ubiquitous wi-fi is an order of magnitude more difficult and I would suggest impractical. VoIP simply hasn’t taken off and mobile Skype in the main uses mobile nets to carry the data. 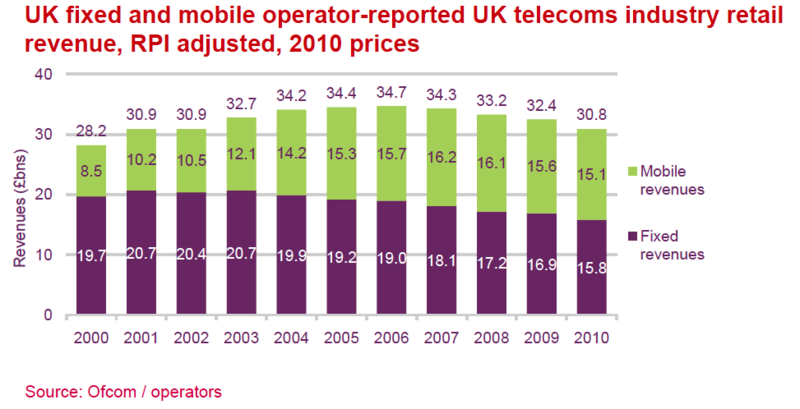 So the mobile spend isn’t going to help your fibre business case here, any more than it has anywhere else in the world. 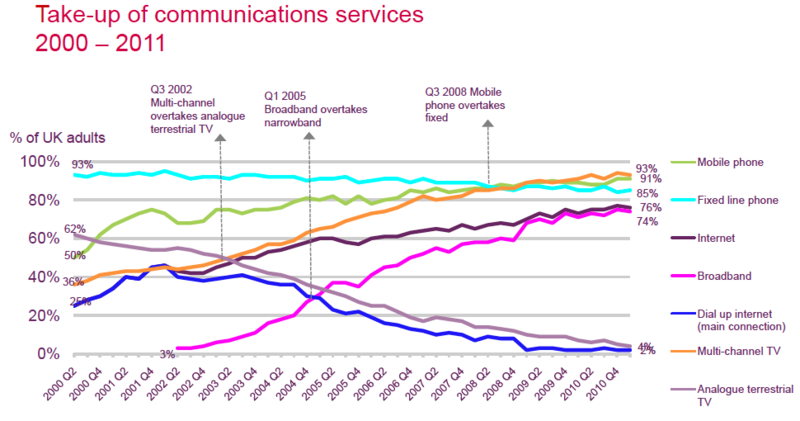 VoIP, or rather Skype, has taken off, according to Telegeography http://bit.ly/pG3LV5. In fact, Skype has carried more international voice minutes than the traditional operators for a couple of years, which has probably played a part in driving down operators’ sales and hammered their profits. If you have free calls via a private network or a friendly operator, there’s not much need to use VoIP. Agree, but I don’t think of it as an addiction, no more so than we are addicted to fresh water or electricity. I think its just another utility. Interesting that people have embraced mobiles, we didn’t need millions spending on promoting their use, handing out free ones or countless consultations and czars to get people to use them isn’t it? I also agree that we need the fat pipes all over the country so that everyone can use them. Most rural areas have little or no coverage, and fibre to the masts would mean there is capacity everywhere. There is fibre all over the country, virtually all exchanges have fibre for their connectivity. Mobile masts can have fibre or radio links. So what saving would there be with FTTP, would Sky Sports suddenly become free? What does the TV licence have to do with costs? Is the same graph twice in the article, or has some part of me failed ? £28 per month on TV – presumably this represents some 10m Sky subscribers and 5m VM customers with the other half of households spending nowt ? Many FTTH schemes have relied on triple play to make them sustainable but presumably that model goes titsup when it hits free TV consumers. Quite right about the duplicate graph – sorry everyone. The correct one is now in place, if you fancy a reality check about making money from telecoms.